John: Welcome to the CharacterStrong Podcast where we have conversations on school culture and leadership. 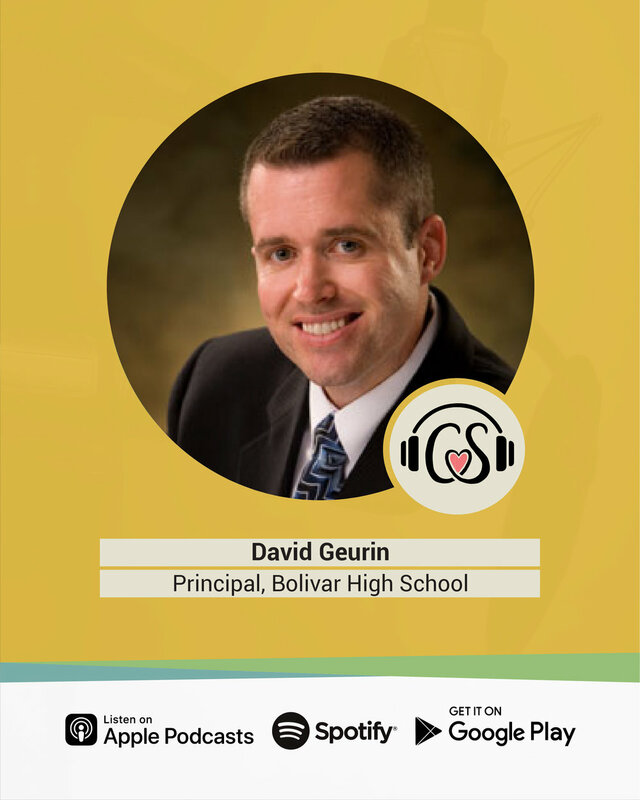 Today as part two of a five part series, where we are talking with David Guerin, Principal of the Bolivar High School Liberators, a National Blue Ribbon school in Bolivar, Missouri. David is a National Digital Principal of the Year, a speaker and author of Future Driven: Will Your Students Thrive In An Unpredictable World? Are you ready? Let's get CharacterStrong with David Guerin. John: All right, well welcome back David, part two of a multi-part series here on the CharacterStrong Podcast. It's awesome to have you with us, talking about just important things in education. Things that we need to be considering when it comes to why you would want to put a focus on character, right? Culture, leadership in your school and so just to get right into it. As part of a blog that you wrote for us, there was multiple things that you challenged people to consider and number two was if we're not intentional about developing character and leadership, it won't happen in our schools. We can't just hope some of these lessons will stick. Non-academic factors will play a critical role in the future success of our students. John: And I know that you talk about this in your book, Future Driven, so what critical role do you believe these non-academic factors will play in the future success of our students? David: Well, the worlds just changing so quickly that the ability to adapt and to be a continuous learner is just important and the soft skills, the character, the leadership skills, these things, the non-academic factors I believe, are going to play as an important of a role as what you know. It's not just what you know, it's what you can do with what you know and a lot of times the soft skills are what allow you to be able to do the things, to leverage the knowledge that you have. And hey, knowledge is just getting cheaper and cheaper. David: I mean, we can get information easier than we ever could before. It's not hard to find the information that you need but to find people who have really, really great soft skills, sometimes, can be a challenge according to the employers we talked to. You know, the people that we visit with that tell us what they're looking for. A lot of times it's hey, we can train on the job, these things, but man, if we can just get students who can take initiative, who know how to treat other people in the workplace, who can work on a team, these kinds of skills helped me to make that more of an emphasis than maybe it used to be for me. David: It's just my own realization that these are some of the most important outcomes. I think these things are, these human only factors, are really, really important. John: Yeah. Well said and I want you to talk about it and I want you to use the language because you tell it so well in your book. But even just that idea, instead of, I don't want to assume that everybody's thinking the same way and you alluded to it in your first response. But, just how it has changed because it kind of used to be, I mean, a lot of times like you say 50 years ago, but it wasn't even 50 years ago and the big picture didn't seem like that long ago even though it might have been but just that idea that in teaching, for so many years, I think the collective thought process was like I am the keeper of the information and as your teacher, I'm now going to give it to you and that has changed, right? John: And so, in your book, you talk about it, maybe go there just a little bit. How has that changed? Specifically kind of talk, given that idea that information is at our fingertips and yet schools, a lot of times, look the same as they did 50 years ago and the set up and different things. How have they changed? David: And it's a struggle, we're changing. We're seeing change happen, I think, in most schools, it's moving so fast, the world's changing so quickly even the schools that are trying, it's hard not to fall behind. David: Just in terms of just how adaptable we need to be and that our students need to be, but yeah, you think about it. You know, I had an uncle who worked in at General Motors, he trained for what he was supposed to do. He worked for 30 years in that same career, probably didn't have a lot of ... curves and had a good pension when he retired and that type of thing. There was a time when you could train for a specific career and that training would serve you well. David: For a long, long time you might stay in the same career for your entire working life but now we know that people are changing careers more frequently. The careers themselves are being disrupted. When you look at LinkedIn, the top jobs that are out there are almost all in the digital world in places that we didn't even have just a few years ago, like cloud computing and artificial intelligence and you know, virtual reality and just all these different things that our students, there's opportunities, lots of challenges too. The ability to think on your feet and to be a passionate learner and to have the skills to work well with people, this things are serving, will serve you very well because as the machine technology is able to take over certain things, they can't take over the things that are the human only factors. David: And that's really why I was drawn to CharacterStrong. I was really searching, looking, I know John, we've talked about how we met at the National Principal's Conference, but I was seeking you out because I had heard a little bit about Character Strong and I was looking for that intentional ... I mean, we knew these things were important in our school, and our teachers were looking for those teachable moments. David: But we had no systematic way to make sure that we were having a message that was consistent and that was keeping these human only factors, these character development, the leadership development in front of our students in a consistent and powerful way and that's what we found with Character Strong, you were the person I needed to see and so that meeting was just absolutely fantastic to get to talk with you that day for a couple of hours and then, or however long it was. It may not have been that long, but it was great. David: And we're off on our journey with that and it has been that piece that we were looking for in our school. John: That's great. Well, and I love, I mean, that conversation doesn't happen if you're not thinking as a building leader through the lens of that systematic piece. That systematic leadership that we know is so important because when we don't have that, then we just keep hoping that whether it's the few teachers who have really caught that vision and are making it important, well, that's not enough for one. Really getting the momentum that we need in our culture, but also, looking at it the same way, we would want our students having a strong tier one, universal, what we're doing for all when it comes to math instruction. Well wouldn't we want the same on the character side, social/emotional learning, emotional intelligence? John: I hope so, right? And if we don't have a systematic approach, you're right. Then how can we guarantee that that's happening and I love how you had that focus and you knew that that was so important and I think what the schools that are early on adopters, like, they get that right off the bat and realize that doesn't happen in one year. John: And can you speak to that? I know there's a lot of talk right now and a lot of people are becoming more and more aware of implementation science that talks about, really, you got one to two years sometimes of exploratory and/or readiness work and sometimes that can be one year because you might already be in a good spot as a staff, but then it's like year one implementation. Year two implementation. Year three implementation and then you're looking at it being standardize work, right? John: What has been your experience in that because we always hear that this, too, shall pass. Well, there's no research anywhere that really backs up that anything takes in nine months, like one school year. David: Yeah, you know, I feel like our teachers were hungry for this and so we've had really, really good just commitment towards this work and towards what we're wanting to do with the character and the social-emotional piece. I think they felt like it was the missing piece, too and so that made it easier but I do think we are experiencing some implementation dip because, and I expected that, even though there's like lots of positives being shared. You know, there are also some struggles in that, too. David: And so you do have to continue to persevere and I think, we've had that conversation, I've had that with a number of teachers that, you know, it's going to get even more automatic or more natural because right now, we're kind of, our students even are a little bit like, what's this about? And teachers just kind of being ready for okay, I'm going to have to, I'm going to teach ... materials are great and the suggestions and the contents great but it's a little bit more preparation on their part, too, you know, to be ready to do that. David: But we, I think we feel like it's something that's just so important that we don't want to just be random and just hope some of this stuff sticks. We want to really be intentional about preparing our students as they go through their school experience, that by the time they graduate, they're really ready for, that they're life ready. Not just ready for college, not just ready for a career, but that they are, they're life ready. David: ... then to just be reacting to discipline problems and just a feeling of toxic relationships or interactions. Be proactive, don't just be reactive. John: Yeah, so instead of the teachable moments just being after a mistake has happened, and in that moment it's never easy and always in some way takes a hit on the relationship. What if we could move it to the proactive where we're having those conversations about things that are all teachable moments but in a proactive way before anything has happened so then when it does, the relationship's not only have already been cultivated, but these conversations have been had ... just like social contracting in a classroom. When we've already talked about it, we can refer back to how does this connect instead of it being just in that reactionary mode which usually does not work out well. John: And when you can get a whole school doing that, really powerful things can happen. I appreciate your sharing, just the real talk when it comes to, I mean, there's always going to be dips when it comes to work that we're doing and that we're trying to implement and change is hard and I do think, just like it is in life, I mean, what a great connection to even character development that it takes perseverance and so, from the beginning, if we're realizing that we have to be intentional with this work and it needs to be systematic and we're looking at it over time, this is not just a one year thing and if we do that, that we could be having greater gains not only in the individual student level but also on that school wide climate and culture. John: So, as we close down this one, and we're moving into the next one, we're going to continue thee conversation in the next part talking a little bit about the soft skills, how valuable they are to the future and technology can "take over" many of the tasks that were reserved for people. We're going to keep that conversation going about the human traits, why they're so valuable and essential even in today's ever increasing technology age that we're in. John: So, thanks for being with us, David, and we'll see you in just a few. David: All right. Great to be here, John. Thanks. John: Thank you for listening to the CharacterStrong Podcast. If you enjoyed this episode, feel free to share on your social media. Please rate, review and make sure to subscribe for future episodes on Spotify and iTunes. Thanks for listening! Make it a great day.